I didn’t know then that reaching Kolkata in the middle of the night wasn’t a good idea. After booking a prepaid taxi, I stepped out of Netaji Subhas Chandra Bose Airport. The numerous yellow taxis that ply this city stood in a neat row before me. Stuffing myself into the car I’d paid for, I told my driver the name of the hotel I was headed to, and the street it was on. Without turning to look at me, he spat a question while chewing something. I heard a muffled “Acha” [Fine] from him, and we were off. The first scene of Jana Aranya [The Middleman] shows us a classroom in Kolkata University, where an examination is underway. We see a student writing his answers off a small piece of paper, taking care to hide what he is doing. We see another student having a book open in his lap. We find ourselves becoming anxious. Bit by bit, the shot widens, and we slowly see the classroom from the point of view of the invigilator. We see that this room looks more like a market than an examination room. Students are seen exchanging answers freely. A few people walk in and drop off textbooks. The invigilator is unable to take action, and merely observes the proceedings from his seat, like many governments and leaders of the past. We learn that the students are being tested on History. We recall the two young men we saw at first, the ones who attempted to hide what they were doing. We now know there wasn’t any necessity for them to hide their actions, yet they felt compelled to pretend as though they were afraid of authority. Even in such chaos, we notice Somnath’s integrity. But Somnath scores very poor marks because the examiner couldn’t find his spectacles while grading. He graduates and looks for a job. After many months of unemployment, he decides to take up work as a middleman. He traverses the length and breadth of his city every day, in his new role. The city gives him the opportunities it chooses. One day, Somnath learns he must facilitate a deal by catering to the base desires of a client. He refuses at first, but gives in and sets about finding a prostitute for the man to spend his night with. He does this in much the same way he went about trying to find a job. Eventually, he finds a woman for his client, and realises only after she gets into the taxi that she is his friend’s younger sister. Finding his voice, he asks her if she is doing this for the money. He tells her they do not have to go through with this. “What about your client?” she asks him. “I’ll worry about it,” he tells her. Even as we witness this conversation in the car, we know we do not actually have to hear them talk. We find their body language provides us with enough clues. We see in her, simultaneously, disgust, pity and resignation. We see him cry at first. Then we see him requesting her to go home. We also see his body language betray these words. We wonder about his posturing, we wonder if he does not really want her to leave. They arrive at the hotel. Somnath receives the order from his client. He proceeds to make a mark in this city, his city. At the cost of his integrity. I stuck my head out the window and tried to find the name of the street. The silence of the night was all around us. I did not see any signs of a university building anywhere around me. “Surya Sen Street must be nearby,” I said. “Where?” I was asked in return. I had not expected such a response. As I tried to continue my conversation with him in the Hindi I picked up from Doordarshan, swear words that didn’t exist in my vocabulary fell on my eardrums. 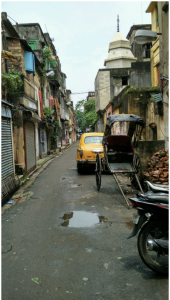 By the time I realised I hadn’t seen the face of the first person I met in Kolkata, the taxi had disappeared into the darkness. I couldn’t see any other living person at that junction where four roads greeted each other. The two layers of jackets I had worn to protect myself from the chill of the airplane threatened to suffocate me in the humid street. I spotted a few streetlights, whose light appeared to hesitate to reach the ground. The tram lines beneath my feet proclaimed in Bengali, “Welcome to the City of Joy!” and vanished into the distance. It was my first time in the city, and yet the streets felt familiar. There can be only one reason for this: Satyajit Ray! Ray grew up in this erstwhile capital of British India. He was born here, he grew up here. Maybe this is why I find myself partial to his Calcutta Trilogy, over that other famous movie of his, Pather Panchali. As a filmmaker, however, I was more interested in the elder brother because he is the vacillating character. As a psychological entity, as a human being with doubts, he is a more interesting character to me. The end helps us understand his character better, when he finally takes a firm stance. He attends an interview at a company that has too few positions and too many hopefuls. There aren’t enough seats in the waiting area. The fan does not work. The heat and humidity of Kolkata wait patiently along with the candidates. A man faints in the oppressive environs of this room, the others carry on waiting in various stages of alertness. Siddhartha’s frustrations are on the verge of boiling over when the interviewers break for lunch. 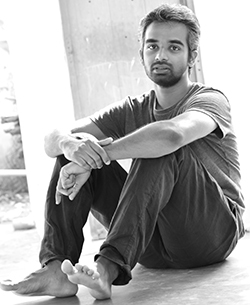 He decides to take up a job offer outside Kolkata, one that he had previously hesitated to consider. That’s when he hears the call of a bird that he had been hearing inside his head all along. For some strange reason, we have to await the right moment to listen to our inner calling. At the age of twenty nine, Haruki Murakami sets out to watch a game of baseball one day. As the bat makes contact with the ball, and the ground fills with the applause of spectators, he has a revelation that he’s meant to be a writer. Mother Teresa heard a similar call when she was returning to Kolkata from Darjeeling. She quit her job as headmistress of a convent school and established Missionaries of Charity, to which she dedicated her life. In Pratidwandi, the bird’s call can be construed as Siddhartha’s calling to leave the city. Renouncing beloved possessions when seeking truth is an important stage in the quest for spirituality. Twenty five centuries ago, Prince Siddhartha left behind his palace and other worldly possessions on his quest for the truth. The Siddhartha we are invested in, leaves behind the beloved city of his childhood, and the city helps him do this. Standing on that dark street in the middle of the night, I flagged down another taxi and told the driver the street I had to go to. Then he gave me directions. As I walked to my hotel, I found I wasn’t the only one on the street. I saw people sleeping in the corners of the roads and in front of shops. I was surprised that they weren’t startled by the arrival of a stranger, that they weren’t disturbed by my presence. The fear I had carried with me so far dissipated. What is a city if not its people? The first Satyajit Ray movie I watched was Mahanagar [The Big City]. It’s his best film on Kolkata in my opinion. 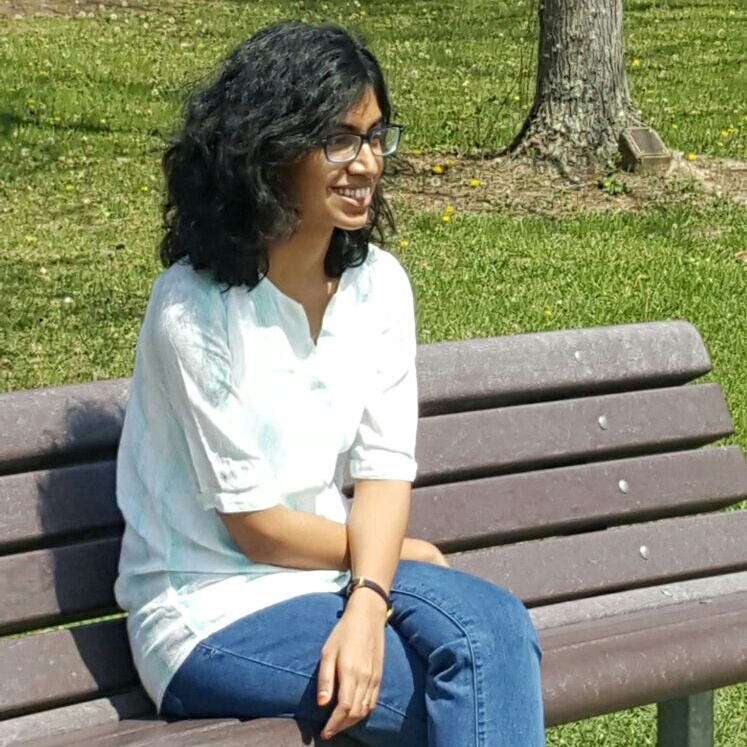 Owing to circumstances, Arathi, a middle class housewife, starts working as a saleswoman. 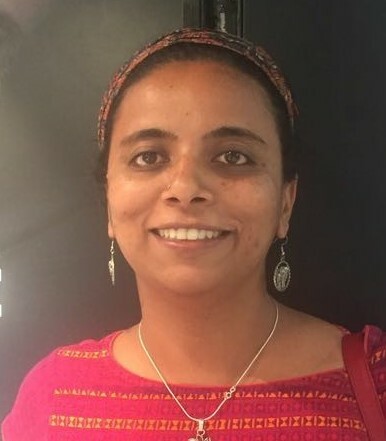 When she speaks out against an injustice that her colleague suffers, Arathi loses her job. Her husband is unemployed as well. In the final scene, we see Arathi and her husband walk along the streets of Kolkata with dignity and confidence. They do not flee the city like Siddhartha, and they do not attempt to compromise their ideals like Somnath. The city offers them another chance for a fresh start. 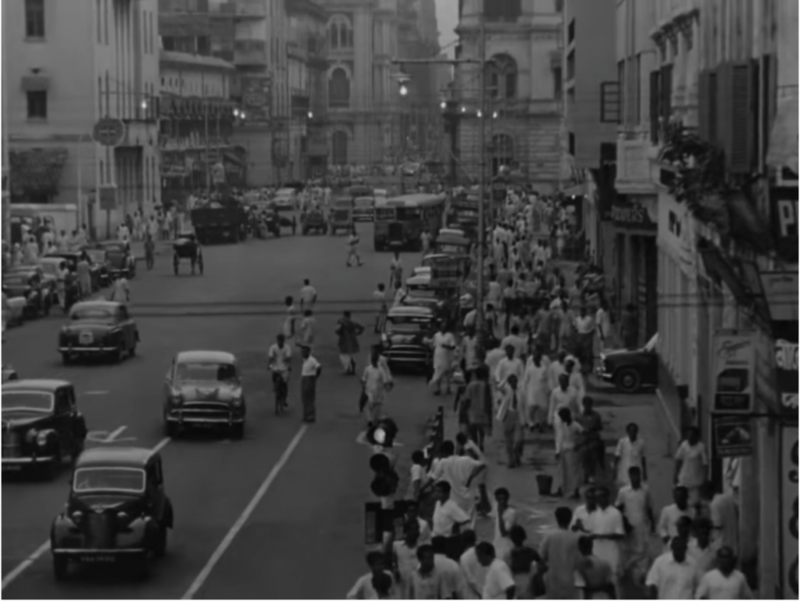 The physical landscape of Kolkata is hardly seen in Mahanagar. It is worth mentioning that Ray has never sought to glorify Kolkata. His characters are merely inhabitants of the city. These characters might always reside in this city, but their thoughts, concerns and worries are universal. Yet the city’s idiosyncrasies can be found in these characters. All people who inhabit the city become a part of its soul. It can be said that the city writes the stories of its people, and people write the stories of the city they live in, and so on, in an endless loop. 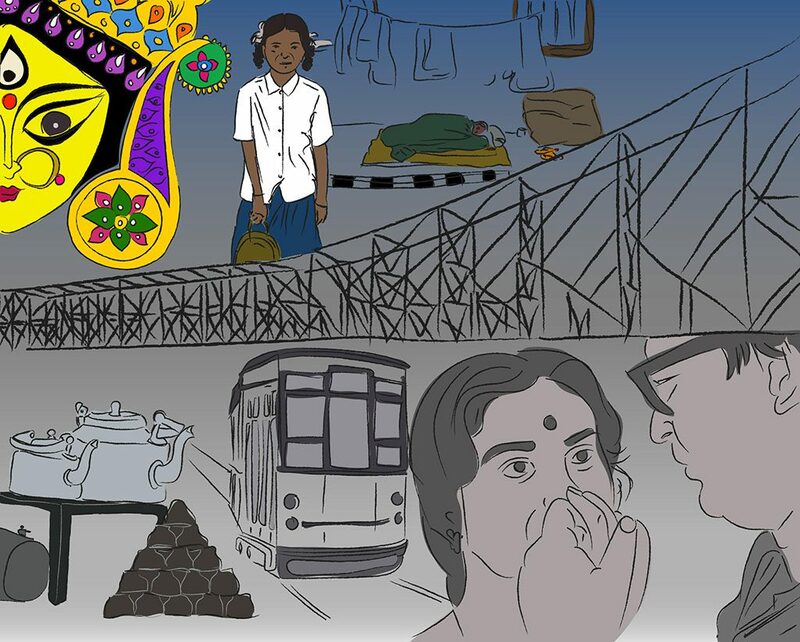 I tried to recollect the unique facets of Kolkata’s personality. Its broad roads, yellow taxis, colonial era architecture, the trams that are still functional, rickshaws pulled by hand, narrow streets, the ubiquitous Kali statues, buildings blackened with soot, Durga Puja festivities, the sweets, the four-rupee tea served in a clay pot , the books strewn all over College Street, the auto that has no qualms in running over preoccupied pedestrians, the parks in the centre of the city, Sealdah market, Howrah train station; there is an image that goes beyond all of this. During the days I spent in Kolkata, I had to leave my hotel room at six every morning. I would walk along a street that was just wide enough to accommodate two cyclists side by side. The street was usually silent at that hour, and chaotic at all other times. At the end of this street, I would pass a tea stall that used the street as its premises. A group of people could be seen there, having their cup of tea, and some bread to go with it. Their gaunt bodies spoke stories about the work that awaited them after this tea. This street opened into a slightly wider street, probably the width of three cycles side by side. The wider street was also home to an elephant faced deity, who was a guest for a short time each year. The walk from College Street to AJC Bose via Bow Bazaar would take me about three quarters of an hour. On my way, I would walk past many streets of varying widths, many tea stalls, many puddles of water left behind by the previous night’s rain, past the many women carrying water, the queue outside public toilets, the market that disrespects the silence of the morning, the goods that arrive from obscure corners, past the men sleeping on sidewalks; on one such walk, I saw a scene I haven’t been able to forget. A family was sleeping in the corner of a busy road, oblivious to the buses and trams that clattered past them. I counted about ten people, few of them asleep. A woman was awake and seated upright. Beside her, leaning on the median between the road and sidewalk, there was a girl, about ten years old, bright-eyed but sleepy. She was wearing a white uniform and a sweater. I wondered where she’d had her bath and how she could have gotten dressed. The seated woman helped this girl put on her shoes. They talked among themselves, shared a few laughs. Once she crossed the road and started her day, you’d never be able to guess she lived on the street. The median she was leaning on could be thought of as a fragile barrier between her current life and the aspirational life her education might provide her. This city allows her to take the leap from this life to another, possibly better life. Maybe, in a few years, this family would have moved to a house. Another family from a different part of the country might replace them at the corner of the road. They too will have a girl who wears a school uniform and crosses a median. As long as the city provides opportunities for this to happen, it will continue to be a city of hopes, dreams and aspirations. Maybe this is the soul of Kolkata. And maybe this city will continue to be Kolkata as long as this hope lives. Undigital Indian – A shrinking minority in India, who are reluctant to adapt to the digitization drive of the country. Few examples: people who don’t use Paytm or Amazon, who queue up in front of ATMs and ration shops, who use any mobile without 3G, who still know how to fill up bank challans, who don’t use IRCTC, and so on. Bala has been inconsistently pursuing different things, not limited to travelling, writing amateur poems and travelogues, crowd-watching, reading, running, reflecting and aimless wandering. He spends the rest of his time playing with microscopes in labs, hoping to explore the bigger meaning of life. He blogs at https://snbalaa.wordpress.com/. Images within the essay belong to the author. 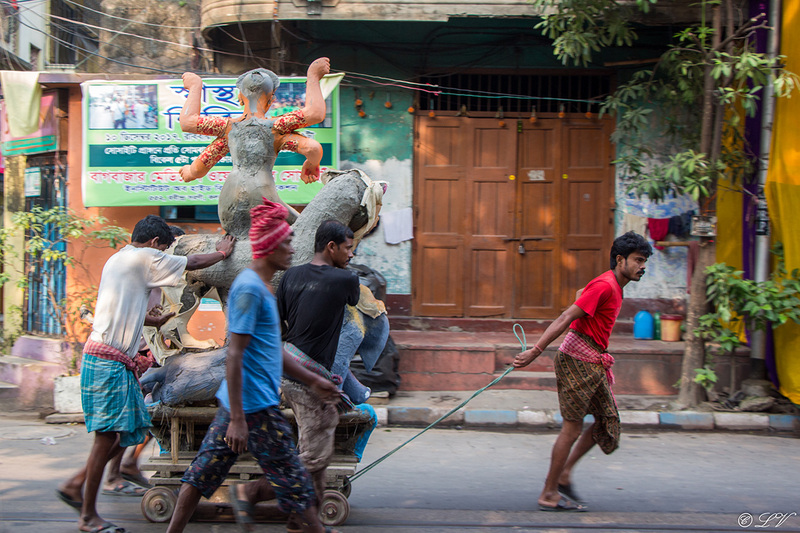 Featured image: “Re-visiting north Kolkata after ages I saw the idol of a goddess being transported down the streets of Shobabazaar.” Photograph by Leah Verghese. 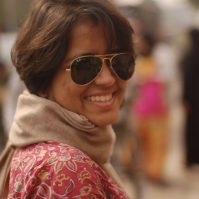 Leah is a burnt-out lawyer who now works with Amnesty International India. She loves exploring new places, DSLR in hand. Some of her pictures make their way to Instagram. Images may not be reproduced without permission.